23 June 2018. ILRI, Addis Ababa. On the occasion of its 100th birthday (1918-2018), the Wageningen University andWorldwide Alumni Day. 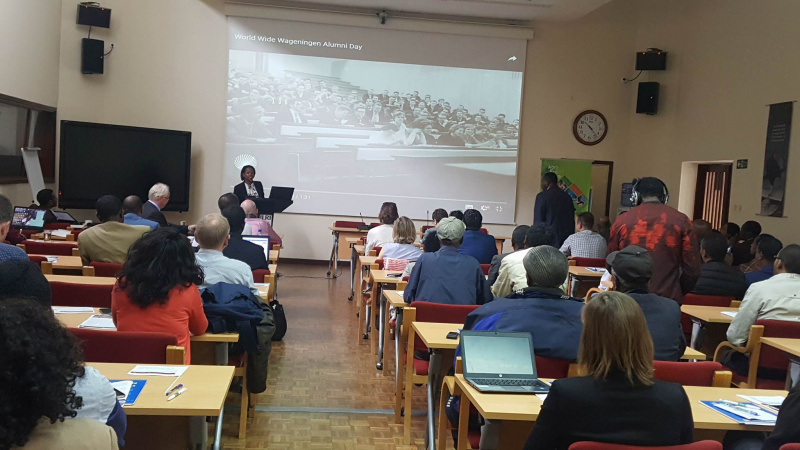 With the support of Ethiopian WUR alumni, The Netherlands Embassy and the WUR-‘Bilateral Ethiopian-Netherlands Effort for Food, Income and Trade (BENEFIT) Partnership’, the AgriProFocus Network in Ethiopia organized this Alumni Day. Since WUR has a unique understanding of the entire food chain, the central theme of the Alumni Day was ‘Access to Healthy Food in Mega Cities’. All the ideas exchanged by the participants during the day were used as an input for the online worldwide dialogue organized to invite prominent alumni from Africa, Asia, South America, the US and Europe, to discuss the challenges and opportunities around access to healthy food in metropolitan cities worldwide. From a nutrition-sensitive agriculture platform with the EU Delegation in Ethiopia to a 3-day workshop with the Food and Business Knowledge Platform (Fand BKP) to identify how to make Ethiopia’s agrofood value chains more nutrition-sensitive, AgriProFocus has already built a large reputation and will continue to explore how to use the power of its multi-stakeholder network to support its network members to increase their individual and collective impact to ensure sustainable food & nutrition security in Ethiopia. Please find hereafter the link to the Wageningen University – “Access to Healthy Food in Metropolitan Cities in Africa” report.